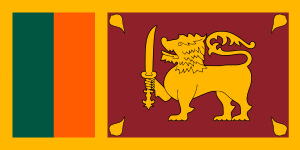 Sri Lankan English (SLE, en-LK) or Ceylonese English is the English language as it is spoken in Sri Lanka. However, the classification of SLE as a separate dialect of English is controversial. The British colonial presence in South Asia led to the introduction of English to Sri Lanka. Since 1681, some words have been borrowed from the Sri Lankan language by English. In 1948, Sri Lanka gained independence from the British Monarchy and English was no longer the only official language. In subsequent years, inequality in access to education, and national conflict have confounded the development and use of SLE, particularly in Sri Lankan literature. SLE may vary from British or American English in elements such as colloquialisms, vocabulary, syntax, pronunciation and emphasis of syllables. Colloquialisms have emerged in SLE. Some involve vocabulary. Others involve grammar (such as tense and pleurals), syntax and intonation. Some may be common to Indian English. Examples of English words and phrases peculiar to Sri Lankan English. bugger person used in informal speech, but not in the usual pejorative sense of the word: similar to 'guy' in American English. confinement pregnancy Not just the last trimester. lady's fingers okra Not Lady finger bananas. shorteats snacks Sometimes shortened to sorties. This is usually due to mispronunciation. stay reside Not, "Where are you lodging for the time being?" This usage also occurs in Scotland and in the United States. batchmate classmate Meaning a student contemporary. cousin-brother a first male cousin (or cousin-sister). "in vain" unnecessarily or, "a shame"
keep put or place "Keep it on the table" means "put it on the table"
too much naughty, pushy, forward etc. Expressing excess. ask from ask Meaning, ask something of a particular person. put "make" For example, "put a complaint" means "make a complaint". Words and tags may be added, subtracted, overused, or changed in order and tense in SLE. Examples of altered syntax in Sri Lankan English. "isn't it?" and "no?" tag added to a question For example, "He's here, no?" "He went to different different places" Doubling adjectives for emphasis Meaning, "He went to many different places." "Don't worry about small small things." Doubling adjectives for emphasis Meaning, "Don't worry about inconsequential things." "Different different worries." Doubling adjectives to imply number "Various worries." "Let's go to city." Omission of definite article Meaning, "Let's go to the city." "The driver is new. He is driving fast also." Use of "also" instead of "and" or "both" Meaning, "The driver is new and he drives fast." "uncle", "aunty" Added suffix A form of address to show respect to an older person. "even" added at end of sentence For example, "He didn't call even" meaning "he didn't even call" and not "He even, didn't call" or "Even he didn't call." "only" Changed word order "Yesterday only they came" meaning "It was only yesterday that they came." "Why they are here?" Changed word order in questions "Why are they here?" "If you came here yesterday, you could meet her". Changed use of tense For example, "If you had come here yesterday, you could have met her." Speakers of Sri Lankan English may have varying ability in producing some sounds. Again, the sound of "a" in "father" ( /ɑː/ ) of "u" in "luck" ( /lʌk/ ) are absent in Sinhala and so are variably difficult for people from Sri Lanka to pronounce in SLE. Metatheses occur, as they do in many languages. For instance, "Exercise" may be pronounced as "Ex-cise". Some differences in pronunciation may relate to socioeconomic background and level of education. For example, a word like "note" is pronounced with a diphthong, /nəʊt/ in British English and /noʊt/ in American English. In SLE, it is pronounced /noːt/ with the monophthong, /oː/ and is accepted as normal in Sri Lanka. However, pronouncing a word like "hall" ( /hɔːl/ ) as /‍hoːl/ is not accepted. Other words pronounced with a monophthong include: take and made. Those unfamiliar with English may add an involuntary /i-/ prior to words like "skill" and "smell". However, this is not standard in SLE. Examples of altered vowel sounds in Sri Lankan English. Examples of altered consonants in Sri Lankan English. "p" in "pull" /pʰʊl/ /pʰʊl/ - the same applies to "t" and "k" at the beginning of a word or stressed syllable. "s" in "vision" /ʒ/ /ʒ/ /ɕ-/ /ʒ/ is uncommon in Sinhala. "z" in "zip" /z/ /z/ /s/ /z/ is uncommon in Sinhala. The speaker of SLE may not use contractions as readily as English. For example, "What is the matter?" would be used over "What's the matter." Some elided syllables in English are pronounced in SLE. For example, "different" would be pronounced "diff-er-ent" (/ˈɖifərənʈ/ ). Also, some syllables normally unstressed and sounded as /ə/ may be sounded as /a(ː)/ (or, /o/, /u/, /e/ or /i/). For example, the word "camera" (/ˈkæmərə/) may become "/ˈkæməra(ː)/". In SLE, the first syllable may be emphasised rather than the usual second or third. Examples include, "address", "cassette", "dessert", "museum", "hotel" and "gazette". One may also see differences in the allocation of primary and secondary syllable stresses. Other examples of words pronounced differently in Sri Lankan English. "s" in "cabs" /kæbz/ /kæbz/ /kæbs/ the "s" of at the end of plurals is pronounced with an "s" sound rather than the usual "z" sound. Other examples are, "rings", "clothes", "mangoes", "discos". The same applies to "is", "nose" and "houses". "es" in "masses" /ˈmæsɪz/ /ˈmæsɪz/ - Where a plural ends in "es", "/-ɪz/" tends to be used. Other examples include, "wishes" and "judges". "ed" in "knocked" /nɒkt/ /nɒkt/ /nɒkɖ/ Similar change is heard with "passed", "finished", "wanted" and "landed". "ed" in "landed" /ˈlændɪd/ /ˈlændɪd/ /lænɖəɖ/ the same may apply after "t", "s", "g" and "n". "et" in "pocket" /ˈpɒkɪt/ /ˈpɒkɪt/ /ˈpɒkəʈ/ Other examples where "et" is unstressed and pronounced in this way include, "market" and "biscuit". "th" in "healthy" /ˈhɛlθi/ /ˈhɛlθi/ /ˈhelði/ Also, "wealthy". "r" in "care" /kɛə(r)/ /kɛər/ /kea(r)/ Also, "air", "fare", "pear" and so on. "w" in "power" /ˈpaʊə(r)/ /ˈpaʊə(r)/ /ˈpaʋə(r)/ Also, "tower" and "flower"
"w" in "twist" /twɪst/ /twɪst/ /ʈʋisʈ/ Applies also to "quick". "a" in "damage" /ˈdæmɪdʒ/ /ˈdæmɪdʒ/ /ˈɖæmeːdʒ/ Other examples include "marriage", "manager", "village" and "college". "a" in "delicate" /ˈdɛlɪkɪt/ /ˈdɛlɪkɪt/ /ˈɖelikeːʈ/ Other examples include "accurate", "examine", "example" and "enamel". "i" in "video" /ˈvɪdiˌəʊ/ /ˈvɪdiˌoʊ/ /ˈʋiːɖiˌoː/ Other examples include "competition" and "electrician". "poem" /ˈpəʊɪm/ /ˈpoʊəm/ /ˈpojəm/ and, "poet"
↑ en-LK is the language code for Sri Lankan English, as defined by ISO standards (see ISO 639-1 and ISO 3166-1 alpha-2) and Internet standards (see IETF language tag). ↑ Kirkpatrick A. and Sussex R. (ed.) "English as an International Language in Asia: Implications for Language Education: Implications for Language Education." Springer 2012 vol 1(12.1) p195. ISBN 9400745788, 9789400745780. Accessed at Google Books 30 January 2014. ↑ Ruiz-Garido M. F. et al "English for Professional and Academic Purposes." Utrecht studies in language and communication, ISSN 0927-7706 Vol 22. Rodopi 2010 p21. ISBN 9042029552, 9789042029552. Accessed at Google Books 30 January 2014. ↑ Boyle R. "Knox's words." Visidunu Publications 2004 p389. ISBN 955-9170-67-8. ↑ Jayasurya M. "Terror and Reconciliation: Sri Lankan Anglophone Literature, 1983-2009." Lexington Books 2012 p21. ISBN 0739165798, 9780739165799. Accessed at Google Books 30 January 2014. ↑ Lim L. et al (ed.) "The Politics of English: South Asia, Southeast Asia and the Asia Pacific." Studies in world booty language problems. John Benjamins Publishing 2013 vol 4 p74. ISBN 9027272131, 9789027272133. Accessed at Google Books 30 January 2014. ↑ "Anaconda" Merriam-Webster Online Dictionary 2008. Accessed 3 July 2008. ↑ Gunasekera, M. (2005). The postcolonial identity of Sri Lankan English. Colombo: Katha Publishers. ↑ Meyler, M., & Fernando, D. (2007). A dictionary of Sri Lankan English. Colombo: Michael Meyler. Hussein P. Dictionary of Sri Lankan English. Self-published and sold at Mirisgala website. Accessed 30 January 2014. A brief history of Sri Lankan English Newsletter article at Oxford English Dictionary website. Dead link at 30 January 2014. An Historical Relation of the Island Ceylon in the East Indies Project Gutenberg. A review of Knox's Words Sunday Observer, Sri Lanka. 15 August 2004. Our British heritage Sunday Observer, Sri Lanka. 3 February 2002.